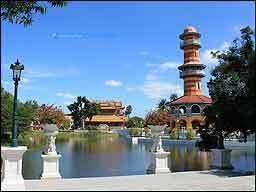 The driver takes you to Ayutthya and Bang Pa In. He waits for your return. Only Ayutthya on this trip. Nothing else. An early departure and a late arrival back. Distance around 270km single trip. 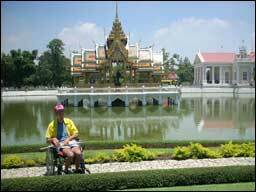 First you will pay a visit to Bang Pa In, one of the Palaces of the Royal family. 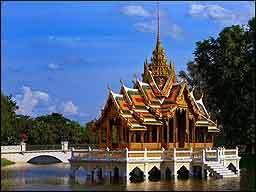 This Palace is still in used by the Royal family for getting together and is situated along the Chao Phraya River. Just 15 km along the same road the ancient temple ruins of Ayutthya can be found. Wat Mahathat with the Buddha head in the tree, Wat Phanan Choen with the golden Buddha, Wat Yai Chai Mongkol with the big lying Buddha. 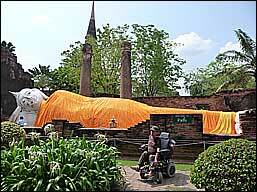 In case you have time you can visit more temples on the ancient temple grounds of Ayutthaya. 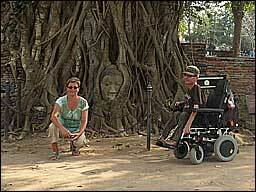 Close to the entrance of the parking of Wat Phanan Choen you will find a wheelchair accessible restroom Thai style. The gate to the toilet is very narrow. 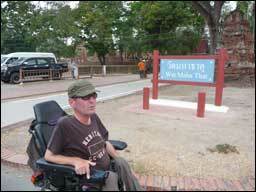 Another wheelchair accessible restroom can be found at the end of the Udon Ratthaya Expressway. In Bang Pa In they allowed us to use the restroom of the staff. These have no steps in front. Included transfer, drinking water in the car, expressway fee and parking fee. Excluded entrance fees, meals, guide, personal expenses, etc.